Today, we are thrilled to introduce Frozen Dunkin’ Coffee as a new, permanent menu item available at Dunkin’ Donuts restaurants nationwide. As one of the chefs behind this latest culinary innovation, I’m here to give you the inside scoop on our all-new Frozen Dunkin’ Coffee. In listening to our consumers, we found that our guests want a frozen beverage that is also energizing and refreshing, with the same flavor and quality of our signature coffee that millions of our guests enjoy to help make the most of their day. For that, we began crafting what is now Frozen Dunkin’ Coffee. This has been a long time in the making. It took us years in the Dunkin’ Test Kitchen to craft a frozen beverage that truly delivers the authentic taste of Dunkin’ Donuts Original Blend coffee. It wasn’t as easy as simply freezing our iced coffee – we had to get the creamy, full flavor just right. 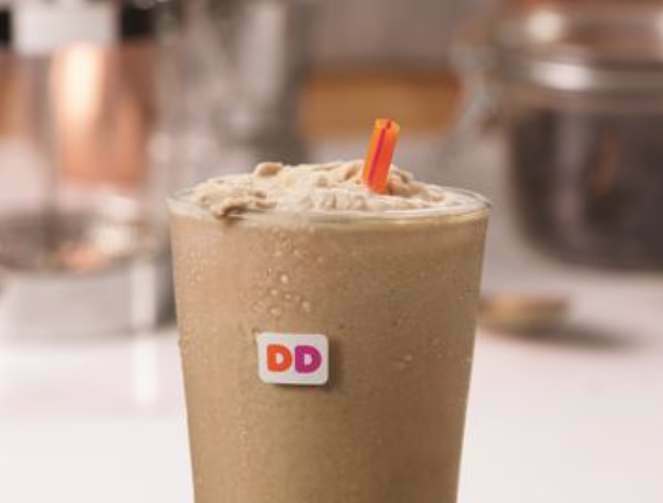 Frozen Dunkin’ Coffee is made with a special extract featuring 100% Arabica coffee to bring forward the signature flavor of the brand’s premium coffee, blended with ice and dairy for a rich, sweet and creamy beverage to keep guests energized any time of day. Even better, you can customize Frozen Dunkin’ Coffee with your favorite flavor shots or swirls and choice of dairy. Have your Frozen Dunkin’ Coffee made just the way you like it with cream, skim milk or whole milk plus flavors like Mocha, Caramel, new Coconut Crème Pie or fan favorite Butter Pecan. The years of work bringing this product to life was well worth it. We are proud of our new product, and want to give you a taste so you can see for yourself. Dunkin’ Donuts will welcome the summer season on Friday, May 19 by offering all guests a complimentary sample (3.5-ounce) of Frozen Dunkin’ Coffee from 10 AM to 2 PM at participating Dunkin’ Donuts restaurants nationwide, while supplies last. Can’t wait for Frozen Dunkin’ Coffee? No need… you can keep cool with one today at your local Dunkin’ Donuts restaurant. To learn more about Frozen Dunkin’ Coffee visit news.dunkindonuts.com/news/FrozenDunkinCoffee. And be sure to share your excitement on Facebook, Twitter and Instagram!